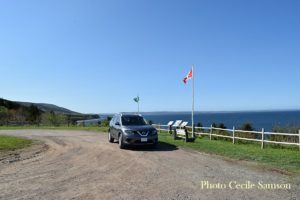 The other day we took a little drive around Port Hawkesbury and pulled over at Christie’s Look-Off in Craigmore. This beautiful view looks over the St. Georges’s Bay near the Strait of Canso. An interesting tidbit tells of in the early years, relatives on both sides of the bay communicated by lighting bonfires on the hilltops. They sent messages of celebration of the old Gaelic festivals, change of seasons and of the deaths of family members.